Hur In-hoi of Korea, 26, captured his second KPGA Tour win at the Herald-KYJ Tour Championship on Friday. In the final round at Lotte Skyhill Golf Club in Seogwipo on Jejudo Island, Hur shot a 1-under 71 for a total of 12-under 276. The second place was shared by three players: Choi Joon-woo, Kim Hyung-tae and Kim Gi-whan. They were four strokes behind Hur, who carded four birdies against three bogeys in the final round. “Honestly, I didn’t expect to win. I tried to take pleasure in playing, as the tournament was the season closer,” Hur said. “Talented players cannot beat practice maniacs. But no matter how hard a player practices, he cannot beat an opponent who takes pleasure in golf. By and large, he demonstrated stable form: 1-under, 7-under, 3- under and 1-under in the four rounds. In the second round, he tied the course record of 5-under 31 in the front nine holes ― a record he set himself at the 2005 Lotte Skyhill Jeju Open. Hur was rated an undisputed No. 1 as an amateur. He was a member of the national amateur team in 2005 and 2006, but was eliminated from the national team lineup for the 2006 Doha Asian Games due to an unexpectedly poor record in tryouts. He debuted on the Korean Tour in 2008 and won the Philos Open, his first win in his debut year on the tour. But aside from the Philos Open win, he was little noticed as a professional. He said that he will concentrate on the Korean Tour next season. Choi, 34, fired a 2-under on Friday. He is little known as a professional, but has previously gained the spotlight as a promising golfer who won 10 times overseas as an amateur. He swung a golf club for the first time when he was 11. He turned pro in 2006 at an advanced age ― for a professional golfer ― of 27, while most junior players enter the pro world in their late teens. Kim Hyung-tae, 36, and Kim Gi-whan, 22, both carded a 1-under 71 Friday. They shared the lead in the first round. Kim Hyung-tae tried to wipe out the bad memory of ending up second in the Korea Open by one stroke. He lost the title as he was slapped with a two-stroke penalty for his club touching the ground in the hazard zone. In the money race, current leader Kang Sung-hoon, 26, secured the honor, as his closest opponent Ryu Hyun-woo shot a 2-under 73 and was edged out of the top 10. Kang shot a 3-over 77 in the final round, ending the tournament with an even par 288. If Ryu had won and Kang had placed fourth or lower, their money rankings might have been switched. Kang earned 475.52 million won ($448,400) before the closing event of the season, which is about 34.42 million won ahead of Ryu in second with 441.094 million. “My goal next year is to return to the first division. 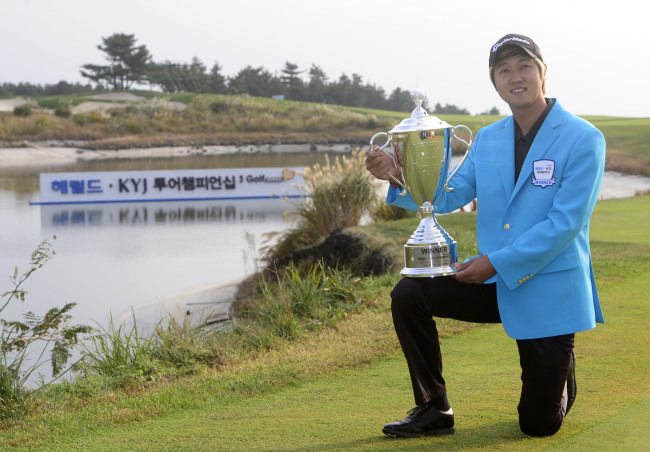 I feel at ease to be seeded to play for five more years on the KPGA Tour,” said Kang, who won the 2013 Korea Open.